Girl Scouts celebrates its 106 year anniversary on March 12, 2018, and we honor its founder, Juliette Gordon Low, or "Daisy" as she was affectionately known, a real Savvy Auntie. Juliette Gordon Low, who grew up in Savannah, Georgia, suffered from partial deafness, but this didn't stop her multiple talents and passions. Juliette was known as a child as a poet and artist, and an animal lover. She also enjoyed swimming, rowing, canoeing and standing on her head. In fact, the Girl Scouts reports that Juliette "stood on her head every year on her birthday to prove she still could do it, and also celebrated nieces’ and nephews’ birthdays by standing on her head." At age 26, she married William Mackay Low, but remained childless through their ultimate separation and her husband’s untimely death in 1905. Then in 1911, focused on her life pursuits, Juliette learned of Sir Robert Baden-Powell, the founder of the Boy Scouts and Girl Guides, and became interested. Legend has it that she was so inspired by Sir Baden-Powell that she called a distant cousin and said: "I've got something for the girls of Savannah, and all of America, and all the world, and we're going to start it tonight!" 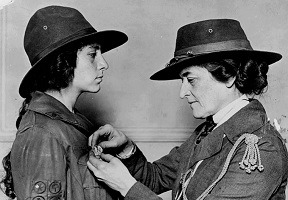 On March 12, 1912, Margaret "Daisy Doots" Gordon, Juliette’s niece and namesake, became the first registered member of what would be the very first troop of American Girl Guides, later to be called Girl Scouts. Over the last century, 50 million girls, women and men have been members of the Girl Scouts. The Girl Scouts describe their founder as "an ardent believer in the potential of all girls and the importance of fostering their individual growth, character, and self-sufficiency," and credit her with "establishing and nurturing a global movement that has changed the world." It's no wonder that in 2012, on the occasion of the 100th anniversary of Girl Scouts, then President Barack Obama posthumously awarded Juliette the Presidential Medal of Freedom for her “remarkable vision" and in celebration of “her dedication to empowering girls everywhere." While Juliette Gordon Low did not have children of her own, she has been a BenevolAuntie and inspiration to millions of young girls for decades. Happy 106 years, Girl Scouts! Edited and updated from a previously published 2012 version of this story.